Will Eating Raw Eggs Kill You? When I eat raw eggs, I often get disgusted looks and hear “Gross! Aren’t you worried about getting sick and dying from eating raw eggs? !” No. I’m not. And if by chance I hit the lottery and actually contracted a food borne illness, then actually had symptoms from it, I would deal with a few hours of GI upset and move on. Eating raw eggs can be especially nutritious, but still, so many people think you’ll die from them. This is not even remotely true. Salmonellosis is the food borne illness commonly associated with raw egg consumption. Let’s dig a little deeper and talk a little bit more about salmonella, as well as the risk of any serious consequences resulting from exposure to it. Salmonella is a bacteria which causes salmonellosis. This is the same type of bacteria that can cause certain food borne illnesses. You’ve probably had a bout of this before, and if you haven’t, you probably haven’t gotten out of your comfort zone or traveled much. A food borne illness, or a bacterial intestinal illness, is noted by your immune system as an invader. Your immune cells scream “RED ALERT! GET THIS INVADER OUT OF HERE” and evacuate your intestines. Smart, yet unpleasant. Salmonella is one of the foreign invaders. Salmonella is usually subclinical, meaning no signs or symptoms, it may eventually lead to gastrointestinal distress, diarrhea, abdominal cramping or short-term fever. The vast majority of cases of salmonellosis resolve on their own within 1-3 days. Patients with compromised immune systems (young children or elderly) may respond with a high fever or severe diarrhea. In these cases, a round of antibiotics may be administered to fight off the bacteria and speed up the healing process. Usually, salmonella is not even detected or reported. In the cases where it causes symptoms, they are generally very mild and last about a day. The vast majority of the salmonella bacteria comes from the feces of animals or sick animals themselves. Salmonella is associated with poultry products because conventionally raised hens are jammed into hen houses tighter than sardines in a can. 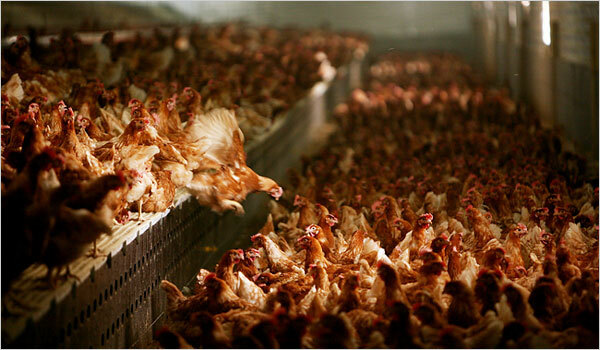 This leads to sick animals with higher rates of infected feces, which end up covering other hens and the eggs they lay. Yet another reason that, as always, source matters. Studies have found conventionally raised eggs have a far higher risk of salmonella than healthy, pastured hens. Salmonella can reside on the shell of the egg, and be contracted from handling the egg or cracking it and sending the bacteria inside. The bacteria may also be inside the egg itself, meaning the risk cannot be washed away. Salmonella multiplies rapidly when left in warm conditions. This is why we worry about recipes with raw eggs sitting out all day. WHAT ARE THE RISKS WITH EATING RAW EGGS? Scientists estimate that if you are an average consumer of eggs, you will encounter salmonella ONE time over the course of 84 years. Since most instances of salmonella exposure go unnoticed or unreported, encountering the bacteria once in an above average lifetime seems like a worthwhile risk to me. Over the last 20 years, there have only been 5 (FIVE) reported cases of death from poultry related illnesses as a whole. This means raw chicken, eggs, and anything in between, from all sources. This includes the vast majority of the sick animals that are kept in caged environments, covered and fed each others waste. This includes people who eat raw chicken, a much higher source of salmonella bacteria, keep in mind. To put this in perspective, lightning kills 100 individuals per year in the US. This means you are 400 times (!!!) more likely to die from being struck by lightning than from eating raw eggs or chicken. I will take my chances for the vastly improved nutrient profile and lowered chance of oxidized fats. So will eating raw eggs kill you? No. Don’t worry about eating raw eggs. Especially raw egg yolks. This is the best way to eat eggs to get the most nutrition and minimize oxidation of cholesterol, which is what makes it harmful. Food from healthy animals is inherently healthy food. Food from sick animals is, well, food that may make you sick. Importance here, as always, is source of the animal. Check out a previous article on sourcing your poultry. Not only will you decrease the risk of food borne illness, you will also drastically improve the nutritional profile you receive from your food. If you are eating raw eggs that have been incorporated into a mayonnaise or sauce that has been sitting in the sun all day, your chance is going to be much higher. If there are any bacteria, they will multiply with two factors: time + increased temperature. So a quick rule of thumb is that if you eating raw eggs, get fresh eggs, and don’t leave them mixed into food in the sun all day. Super easy to follow. Remember, if you decide to start pounding raw eggs after this article, just don’t go too crazy on the whole eggs. Raw yolks are always great, but raw whites contain a protein called avidin, which binds to an important B-vitamin, biotin. Biotin supports nerve tissue, skin, GI tract and metabolism. Too many raw egg whites may render this important nutrient unusable. As mentioned in a previous post, wait until the very end to add egg yolks to a smoothie or shake. Gently fold them in so as to not destroy all of the beneficial proteins and fats in the egg! Still afraid to eat raw eggs? Ever contract salmonellosis from them? Join in on the conversation below! Stay tuned for upcoming articles on why red meat, a high-fat diet, cholesterol, raw milk, and others will not kill you! Share this below if you learned something!